I always have such a hard time deciding what to buy the men in my life. Especially my dad and John. They never can give me a clear idea of what they want! I usually just go out to the store and try to wing it and get something that I hope they will like. Now though, I’ve found a holiday gift idea for that hard to buy for man on your shopping list: Schick® Hydro™ 5 Holiday Pack. It’s a little big to be a stocking stuffer unless you have a really large stocking, but I think it’s a gift that a man can actually use! It includes a Schick Hydro 5 Power Select Razor, Schick Hydro Shave Gel, Schick Hydro 5 Refill Cartridges, 2 Energizer Max batteries and a flashlight! The Schick Hydro 5 Power Select Razor is no ordinary razor. It’s battery powered with a Hydrating Gel Reservoir that allows a close shave without irritating the skin.There’s five Ultra Glide® Blades in each razor so it doubles the point of contact on the skin allowing you to shave more comfortably. I think it’s great they even included batteries because I always forget to buy them. John has been using the razor and gel to keep his beard and mustache trimmed and clean for work. He told me that its much better than his old razor and now he doesn’t want to go back! I’m waiting for the day when he will surprise me and shave off all his facial hair. This would be the razor to do it with! The Schick® Hydro™ 5 Holiday Pack retails for $14.99 which is a real bargain if you ask me. 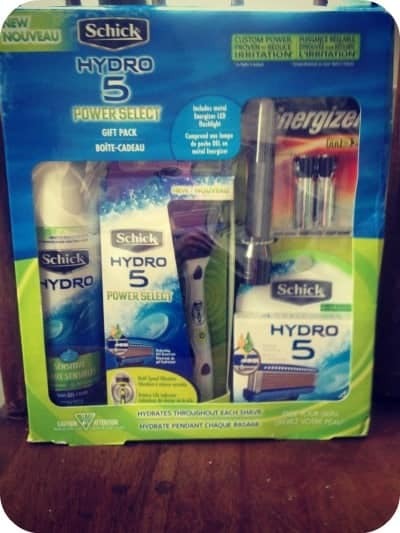 Great review on this Schick 5 Holiday pack. Its got everything a man should need to meet his shaving needs plus a few extras added too. The razor is battery operated which is different . This will be a wonderful gift for any man this Christmas. I like this Schick Holiday gift pack because it has everything you need to give for a male relative! I like the Schick products for myself, and I am sure that my dad or brother would love this for Christmas! I also think that it is a good deal!